Is It Dark in Here? Not Anymore! Never walk into a dark house again! 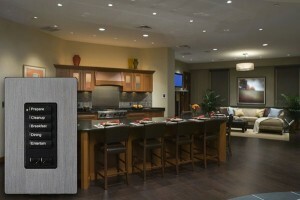 Lighting control is one of the most valuable and security enhancing technologies that one can add to their home. But it doesn’t have to be expensive or complicated. You can simply add a single dimmer in a room that can be controlled from your Universal Remote Control, or you can automate your entire home lighting system. For added security, it can even learn your daily routine, and when set to “vacation mode”, will randomly turn lights on and off so it looks like someone is always home! Whether you are about to build your dream home, in the midst of a remodel, or have lived in your home for years, we offer a myriad of lighting solutions to fit your budget and lifestyle. Think you have to hire an electrician now? Not at all! That’s because Sound Integrations is a state licensed electrical contractor. What does that mean? It means that we can handle all aspects of the wiring process including any and all things high voltage. Need an outlet moved or added? Done! Need new lights added? Done! So give us a call and let us take the shock out of the process. Contact us today and let us ILLUMINATE the infinite possibilities!